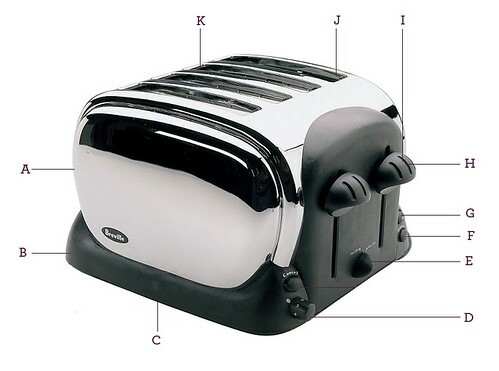 The Breville® Classic Toaster 4™ – A classic, elegant toaster with a menu of features. The extra-lift lever makes it easy to remove smaller items, and the extra-wide self-centering slots allow for perfect toasting. There are also convenient cancel, defrost, and reheat settings that put you in control. The chrome metal design looks great in any kitchen and you can even choose between using just 2 slots or all 4. 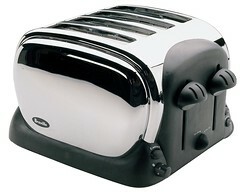 It’s the retro toaster with classic appeal and enough individuality to do what you want, when you want, just how you like it. A. Polished Chrome Body. B. Slide Out Crumb Tray. C. Cord Storage. D. 6 Selection Browning Control. E. Quantity Selection Dial - allows the choice between the use of two or four slots. F. 'FROZEN' Button. G. 'REHEAT Button. H. Extra-Lift Lever. I. Independently Moving Levers. J. Extra Wide Slots. K. Self-Centering Carriage.